This is one of the most useful and interesting tools I’ve come across in quite awhile. 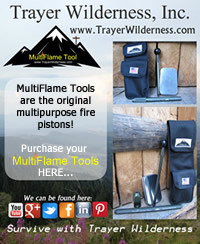 The Trayer Wilderness Multiflame Tool is a multipurpose fire piston developed and sold by Glen and Tammy Trayer who live up in north Idaho. This tool is unlike any fire piston you’ve ever seen. It comes in a well built, nylon pouch that has both a belt loop and also loops for carrying the tool on your rifle sling. The pouch has 3 compartments, one for the piston, one for accessories and another for a char tin that is included with kit. It also comes with 2 replacement rubber o-rings for the piston. 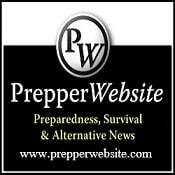 Lets take a look at all the functions and features of this remarkable survival tool that is made right here in the USA. The primary purpose of this tool is starting fires. The Multiflame Tool is, at its heart, an 8 inch fire piston. Fire pistons use the same principal as a diesel engine, using the heat from compressed air to cause combustion. A fire piston can produce an ember, using nothing more than air pressure and a small bit of char cloth. Here’s how it works, the piston shaft has a little indentation at it’s end where you place a bit of char cloth. The piston shaft has a rubber o-ring that makes a tight seal. Simply pushing the piston shaft in the chamber tube, with the proper force, ignites the char cloth. When you pull the shaft out you find a glowing ember that can be removed with your pocket knife, thanks to a groove down the side, and placed in your bird’s nest to start a fire. During our tests we were able to produce an ember on the first stroke a couple of times. Sometimes it took 2 or 3 strokes but it always produced a usable ember. While I wouldn’t necessarily want to use a fire piston as my primary fire starting method, it certainly has it’s merits. When a you are out of matches, the lighter is spent, or you’ve lost your magnesium fire starter, this is a pretty nice backup method. You can never have too many back ups when it comes to building a fire. The piston shaft is drilled and tapped to accept a gun cleaning brush that you can use to clean any handgun 9mm or larger. To use it as a cleaning rod, simply unscrew the knob to reveal the drilled and tapped hole that you can screw your cleaning brush into. One thing I liked was that because it is an 8 inch piston, I could even use it to clean my Ruger Redhawk that has a 7.5 inch barrel. The tool has an adapter that allows you to use a 3/8″ shaft auger bit using the chamber tube as the handle. The tool comes with the adapter but you have to purchase the bit separately. I tested it with a 1 inch auger and it worked like a charm. Being able to drill 1 inch holes makes this tool a valuable addition to anyone’s kit. This enables you to build camp furniture, shelters and even a cabin if you have a good axe to complement it. The end of the chamber tube also accepts 1/4 inch hex bits, making it a screwdriver. The tool accepts flat head and phillips head screw driver bits, nut drivers, and star bits. Use for gun repairs, tightening scope mounts, tightening nuts. Heck, the possibilities are endless! What I like most about this fire piston is that it has such a wide variety of other uses. If you are going to buy a piston, why not buy one that offers uses other than just starting fires? I am a big believer in having multiple back up systems in place for everything that I might need to do. This tool is essentially a back up for 4 kinds of tools that I carry, all packaged tightly and easy to carry. I have had a lot of fun testing this out and you better believe that this tool is now an essential part of my survival pack.